Who is At-Fault in a Rear-End Collision? You may have heard that the car behind you is always at-fault in a rear-end collision. While this is often the case, it is not 100 percent accurate. The circumstances of the accident will determine who was truly at-fault, and sometimes, the leading car can be considered the responsible party in a rear-end collision. If you or a loved one has been involved in an accident, it is important to speak with an attorney. An attorney can help establish liability, but also ensure that the other party does not try to hold you accountable for something that wasn’t your fault. Georgia is not a no fault state; therefore, the driver responsible for the accident will be held at-fault for the damages caused. But, that doesn’t necessarily mean it is automatically the driver at the end of the accident. At times, the front driver could be at-fault. This is because that driver could have hit the brakes suddenly – not giving the following car enough time to stop. Generally, the rear driver should be following at a far enough distance to avoid a rear-end collision. However, at high speeds, if the leading driver stops suddenly, no distance will be adequate enough. Also, if the front driver has burned out brake lights, the following driver cannot tell that they are braking; thus, the leading driver would be at-fault for the incident, and not the following driver. If you are driving and you hit a pothole, you can lose control and collide with another vehicle. This could force you to rear-end a vehicle or force the other vehicle to rear-end you. In this instance, it is not necessarily your fault or the other drivers; instead, it is the party that is responsible for maintaining the road – which could be the city, county, or state. That municipality would then be held responsible for any damages that result from that accident. If you are driving and your brakes suddenly fail or the vehicle behind you had a tire blowout that caused the accident, it would not be the driver operating the vehicle who is at-fault. Instead, it would be the company responsible for maintaining the vehicle, the company that designed the defective product, etc. Sometimes, fault is not assigned to one driver 100 percent. There are instances where one party can be at-fault and the other is at-fault as well, which complicates the collection process. If you are at-fault for your accident, even slightly, you can still file a personal injury claim. But, the amount in which you were at-fault will decrease your settlement value. For example, if you were at-fault by 20 percent, then your settlement would be reduced by 20 percent. 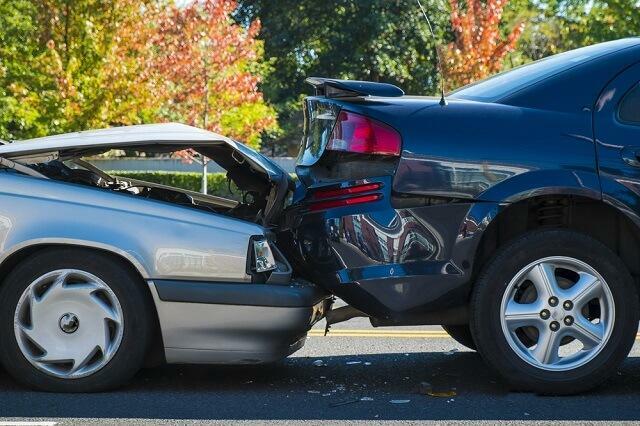 If you have been injured in a rear-end collision, do not assume fault is easy to prove. Instead, you need an experienced attorney by your side to help establish your case. Contact Van Sant Law, today for a free consultation at 404-991-5950, or fill out our online contact form with your accident questions.